The Newest Issue of the ComLINE was just released! You can view and/or download it from the ComLINE Page. ComLINE is our quarterly publication where members, from around the fellowship, share their experience, strength, and hope (ESH) on the 12 Steps, Traditions, and Promises of ACA. If you would like to share ESH from your own recovery journey or view current and back issues, please visit the ACA ComLINE Page. The 2019 ABC/AWC will be held in Malmö, Sweden. More information, including about registration, can be found on the Convention Website. The ABC is only weeks away! Locate your passport. Review travel plans. Consult weather forecasts. Consider outfits. Begin packing. Include your inner child by reading up on Scandinavian culture… preview the sites of Malmö and Copenhagen… eat some lingonberries… listen to ABBA… get excited… have some fun! There is still an opportunity to register as a Delegate, IF you are intending to participate in person in Malmö. And there will be updates on the Delegate Training Page, including the Delegate Binder, as it is compiled. Send inquiries to abc@adultchildren.org. There is information and the opportunity to sign up for meals, lodging and other activities at acaworldconvention.org. This will be combined Remote Delegate and In-Person Delegate Training. It will last approximately one hour (maybe 1 hour and 15 minutes). We will be using Zoom for the teleconference call. See the Delegate Training Page for more details. Questions may be directed to dtsc@acawso.org. The program for the upcoming ACA World Convention can be found on the Convention Website. Please note that it is subject to change. WSO started selling on Amazon a couple of years ago and is reaching more people than ever. However, WSO does not make as much money on those sales due to fees. So we would like to encourage all our members and groups to buy their books from the WSO Shopping Cart. This will help WSO keep more of the sale price to use for furthering the ACA mission. Please help WSO by shopping on our own website at Shop.Adultchildren.Org. As part of our 12th step we try to carry this message to all who suffer from the effects of childhood abuse, trauma, neglect, and abandonment. ACA WSO is grateful for your contributions that help us do that vital work. Check out our flyer titled “Where the Money Goes” to see how we utilize your contributions to carry the ACA message around the world. Please consider making a monetary contribution to help the next ACA receive the gift of recovery. Contributions can be made online, by calling at 562-595-7831, or by mail payable to ACA WSO, 1458 E 33rd Street, Signal Hill, CA 90755. 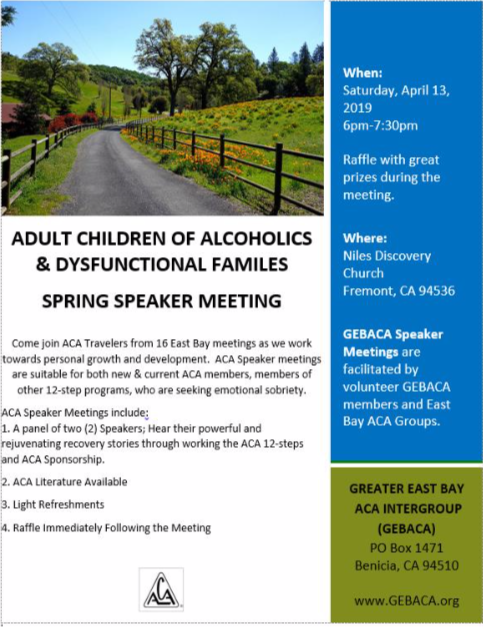 Are you interested in ACA’s history? Has ACA given something to you? Come explore, read or help organize a part of ACA’s history. Any members interested in being a part of WSO Archives should contact archives@adultchildren.org. ACA has two audio Public Service Announcements (PSAs) available for distribution to any outlet where mp3 files can be played for the public to hear (radio stations, internet, etc). They can be downloaded here. Recently, we’ve made changes to the meeting list types supported for ACA meetings listed on adultchildren.org. We’ve added “Young Adult” meetings and consolidated the “Gay/Lesbian” and “LGBT” types into “LGBT+.” Also, a new validation has been added that requires a meeting be specified as “Open” or “Closed” – but not both. These changes were suggestions from members and groups. Please use the Update Meeting Link to update your meeting information and be sure to review the Meeting Types. If you do not know who your group’s private WSO contact is that gets the update emails, please send a message to meetings@acawso.com stating your WSO Number and ask for assistance. The ACA WSO holds its monthly Board teleconference meeting on the second Saturday, of each month. The meeting begins at 2pm Eastern Time; the telephone number is 712-432-0075, access code 427266#. Minutes of past meetings can be found here. Throughout our structure, we maintain at all responsible levels a traditional Right of Participation. You can find the 12 Concepts of Service here.